Watch the Shelton baseball team wrap up the regular season against the Capital Cougars. This is the South Sound Conference regular season finale before both teams head to the West Central District 3 / Southwest District 4 Tournament that begins Saturday. First pitch between the Highclimbers and the Cougars is 4 PM. Dedrick Allan will start the Maple Glen Senior Living Pregame Show at 3:50 PM as the Highclimbers’ seniors will be recognized before the game. The seniors are Dylan Coots and Wade Smotherman. Capital beat Shelton Friday 5 to 4 with a walk off sacrifice fly in the eighth inning. 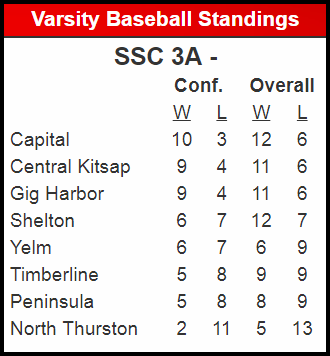 The ‘Climbers are 12-and-7 on the season, 6-and-7 in the SSC, currently tied with Yelm for fourth place. The Cougars are at the top of the conference at 10-and-3, 12-and-6 overall.